Your Angel Card Reading for 6/10 – 6/12! Here is your Angel Card reading/Channeled message for the weekend of 6/10 – 6/12! Grab your cuppa and settle in – it’s a long one! 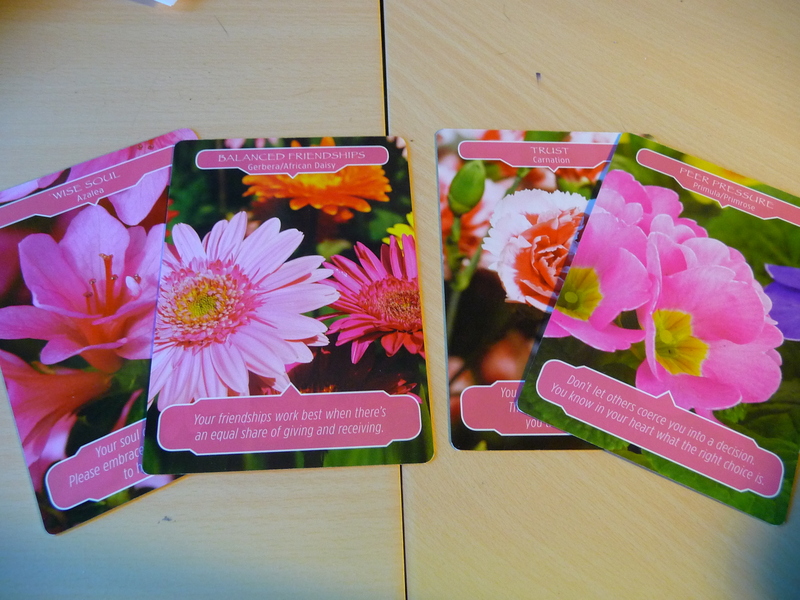 I was directed to the Flower Therapy Oracle Cards of Doreen Virtue and Robert Reeves. I love these cards! I meant to pull two cards, but they ended up being double doubles! So we have 4 cards today. The first pair of cards is BALANCED FRIENDSHIPS and WISE SOUL. Our reading starts with the message that “Your friendships work best when there’s an equal share of giving and receiving.” The hidden card for this pair, that was snugged up against Balanced Friendships, is Wise Soul and it says: “Your soul carries ancient wisdom. Please embrace it, as you have the knowledge to help those around you. The angels tell me that this pairing means you will be reaching into your soul’s wisdom to help a friend in need sometime very soon. You may be feeling really hesitant about what’s coming up for you, and what seems to be wanting to be offered through you — the angels say to please just relax and let that message through! It is exactly what your friend’s Wise Soul is waiting to hear! The angels are using you as a vehicle to get an important message heard. You are being asked to function as an earth angel! Don’t worry, you don’t need to say yes or no or wear wings or anything 😉 Just agree that you are willing to reach into your Soul Wisdom for the words to help at the deepest level possible. Our second pairing is TRUST and PEER PRESSURE, with Trust the snugged up card this time. Interestingly, it almost feels to me as if this pair is for the receivers among you, while the first pair is for the ones bringing through messages hmmm. (1) Someone with whom you are in balanced friendship, meaning there is a lovely amount of give and take and support for each other, a good friend or a new friend for whom you feel real affinity, is dealing with an issue. (2) You are being asked to allow your soul’s wisdom to shine through and speak through you for your friend’s highest good. Your soul has the information/answer/clarity the friend is seeking! (3) Your friend (or maybe you) are facing some peer pressure as you consider doing this earth angel messenger work from your soul. (4) You’ll know from your heart if you are meant to deliver the message, and to whom. (5) OR, if you are receiving messages, you’ll know who’s wise soul wisdom is speaking to you (it will be coming from a balanced friendship person). (6) Don’t be afraid. Know that there are earth angels around (like me) who are appearing now or very soon who will be sharing soul wisdom to address the issue (as I am doing for the angels with this reading). (7) Don’t be coerced – ignore peer pressure – take only the message, or deliver only the message, that resonates with your wise soul. You’ll need to feel your way through this one. If it feels right and wise, when it feels right and Light filled, it is. And don’t be shy – ask the angels to help you with this! They are always there, you just need to ask them to help. p.s. as I prepared to post the photos of today’s cards, I realized that there is a MASSIVE infusion of pink here – pink for self love, open heartedness, love for another. Did you see the huge pink rose quartz photo I posted earlier this week in facebook.com/dinakennedyreiki? It’s all part of the whole for this week’s energies!